Thanks early to everyone who will add me ;)! How does the in game messaging work?? How can you find friends sims in the game..?? If anyone is looking for a marriage mate please consider my sim [b]Lily Bailey[/b]. I want to get rid of her to make more room in my house. If anyone is looking to marry a girl, my sim Lily Bailey is single I need someone to marry her as I want her to leave my household. My player code is below. 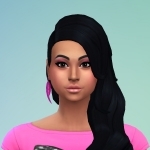 Also please don't enter a relationship with Journey Strickland because I am using her for the 100 baby challenge and need to keep her single. @GetSossied I've been wanting to do a community on a messenger but wasn't sure if anyone would be interested. Awesome idea! If there's a strong storm you'll find me gawking out the window, ignoring the safety warnings. Playing daily, level 30 now. My code is PY6T3DD I give out all stickers and attend parties daily. Hello! I'm a daily player AQTGYAC, currently on level 28 - Innovative Creative.